Pretty Opulent: Revlon Colorstay - I Caved And bought It! 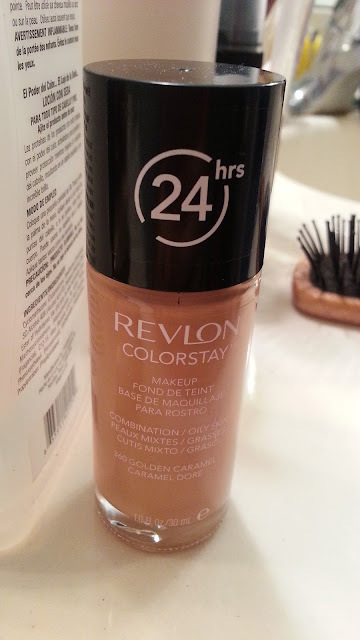 Came across another blog that raved about Revlon Colorstay so I ran out and bought it! Walgreens had a sale so it was buy one get another product 50% off, so I also bought the Colorstay pressed powder compact as well. I'm VERY impressed with the smoothness of application, has GREAT coverage especially with concealer and the color matches very well. And it does what it says...it's long lasting. How did I find my color? This time, not by trial and error. I know my MAC Studio Fix shade (NC42) so I did a search and found this helpful color chart. I definitely agree with all the bloggers out there, this definitely is one of the best drugstore foundations! This along with Revlon HD Photoready. I'm actually not going to repurchase my usual Rimmel foundation - I'm going to stick to Revlon for my drugstore foundation needs! Drawback is that it doesn't come with a pump! Such a BIG drawback for me....makes it unfriendly for travel. Other than that, it's a great foundation. Something funny I found is that for "normal" skin the color was slightly off, in the same shade name and everything. I bought the one that looked more golden, which was the combination/oily skin formula. So I would definitely recommend this one! Gives a natural finish and you can't beat the price!